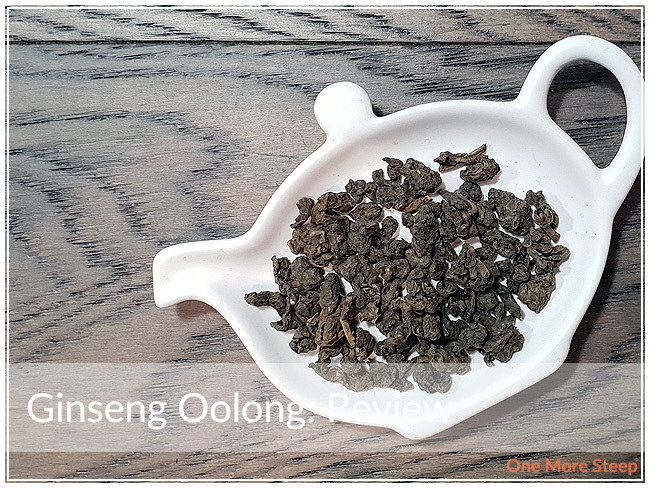 Starting off the week with an oolong review – one of my favourite types of teas for the last little while now! Ginseng Oolong was a Vancouver Tea Festival purchase that I recently rediscovered in my tea stash as I was organizing it. Ginseng Oolong came in a cardboard tube with a bright green label telling me what it is. 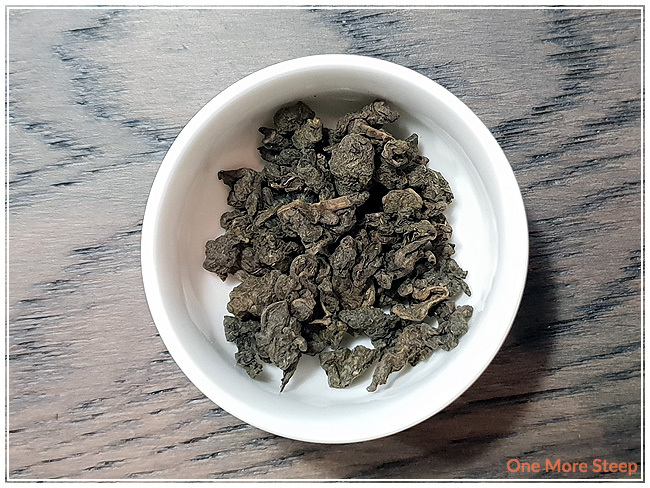 The leaves of Ginseng Oolong are a dark greeny-brown, with an almost dusty appearance to the tea leaves. There’s a mild ginseng aroma to the leaves. 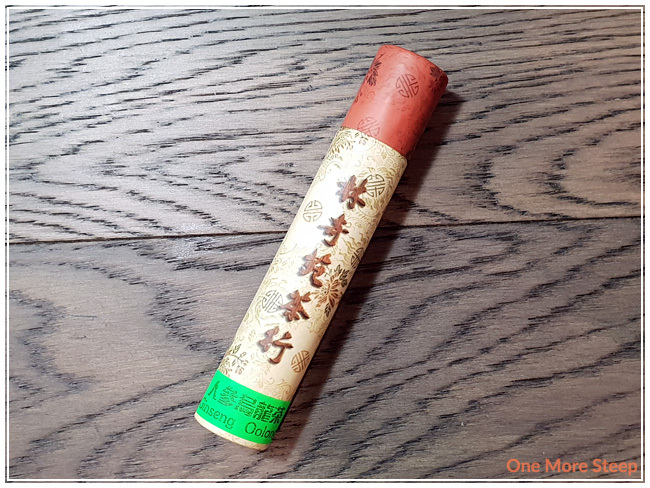 It’s not a knock-you-over type of ginseng aroma that a lot of Chinese medicine shops have (if you’ve ever entered a shop that carries traditional medicinal ingredients, you’ll know what I’m referring to!). Ginseng Oolong consists of oolong tea and natural ginseng flavouring. There were no steeping instructions to be found on the packaging or on the product page. I opted to steep Ginseng Oolong in 195°F (91°C) with my Breville IQ Kettle‘s oolong tea setting for 2 minutes. Ginseng Oolong steeps to a light golden yellow after just the 2 minute steep. The aroma from the cup of tea was primarily that of the oolong tea – with a light ginseng aroma. 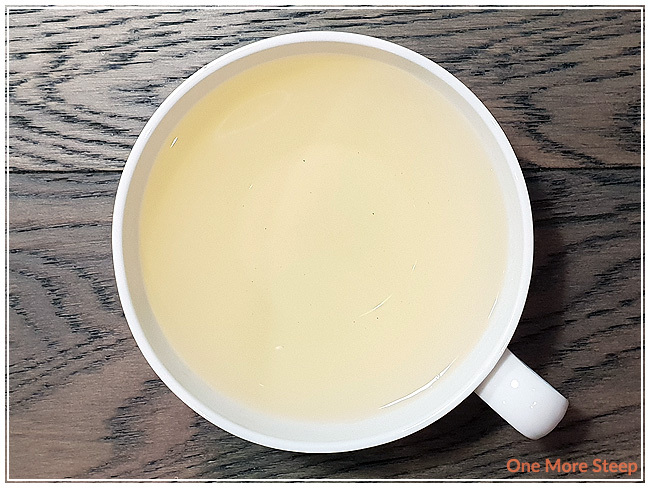 The flavour of the tea is a mix of earthiness, ginseng, and a mild astringency that wasn’t off-putting, it added a bit of mouth pucker to the tea itself. I resteeped Ginseng Oolong five times, adding an extra 30 seconds for each steep. The tea became a deeper golden yellow, peaking in colour for the third resteep. 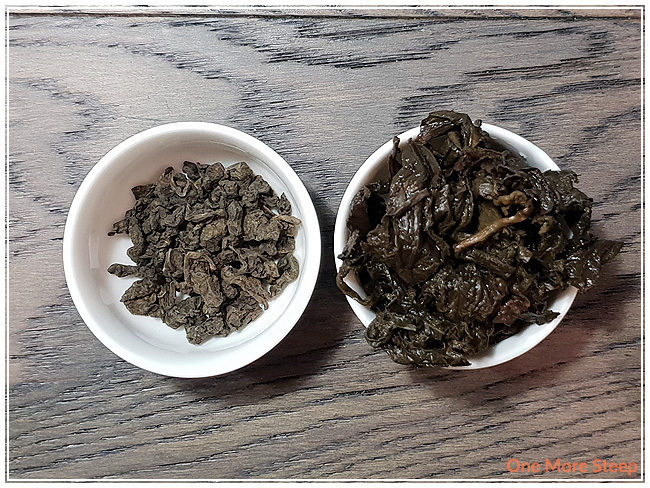 The ginseng flavour was strongest for the second resteep, while the earthiness from the oolong base peaked at the third resteep. The last resteep (sixth steep overall) still had the ginseng and earthy aromas, although it was weaker. I loved Aroma Tea House’s Ginseng Oolong. This oolong tea has a lovely flavour to it, and resteeped so well. It’s definitely a tea that I would recommend resteeping multiple times in order to fully exhaust the leaves out of all that beautiful flavour. It’s a gorgeous colour, and makes for a good cup. I think this would pair really well with something savoury.